"When it came to dealing with the record company, all of us would just want to run away. So we did." 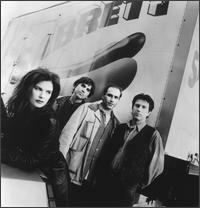 Woody, majestic and crafted with deceptive ease, the music of Canada's Cowboy Junkies has been a favourite of the Hearsay team for longer than there has been a Hearsay. We've tried to interview them on many occasions for your entertainment but their muse has always been walled up behind multinational corporation walls. Until now. Back home on their own label (on which they had originally issued their first two albums in the mid-eighties) after spells on RCA and Geffen, we found them charming, accessible and completely open to the exhaustive Hearsay interview treatment. Margo Timmins, the Junkies' vocalist, was flying in from Florida to Toronto. Ewen Moore, co-editor of Hearsay Magazine, was flying in from Sainsbury's (armed with fresh bread, various vegetables and a sheaf of questions cooked up by him and Neil) to answer her call. Thanks to the wonder of satellite communications lie the telephone) they were able to meet up somewhere miles from their homes, miles above the earth and look down at the world below. HEARSAY: There's such a sense of reminiscence in your music, do you have a favourite memory from your own life? MARGO: I have many! I have very fond memories of certain moments when we're writing and it's just the four of us, wherever we may be, where there's no record company, no crew, no 'voyeurs'. Then the four of us just enjoy playing together. When we were writing Miles from our Home, we started the day working on music but nothing was happening so we decided to go cross-country skiing together. We all went off, skiing over these fields, and got to this peak at the top of the hill just as the sun was setting – we have a lot of those sorts of moments! I'm always amazed that we four, who've been doing this for fifteen years now, still enjoy each other's company. It's not just a job, it's something we enjoy doing together. We have a lot of those experiences – like swimming in all the different oceans we've been able to swim in when on tour! Those are the moments that always amaze me. We're grown-ups, we all have different lives, different families, but when we come together we still enjoy each other's company. After all this time together, do the four of you now work together intuitively or can you still surprise one another? I think we still surprise each other; maybe not as much as we used to because as you get to know each other as musicians – and over the years we've become more competent as musicians – when we're writing there's not that much surprise, but the surprise now comes with our live show. Somebody will start doing something and you'll think, 'what are they doing?!' Those moments come out of nowhere. But when we're writing we have a set pattern of how we do things. I'm always amazed at what my brother can do and when he brings me a song I'm always surprised that he wrote it, but I guess I'm not as surprised as I was ten years ago. Are you conscious of any specific turning points in your career, for good or bad, or has it been a smooth evolution to where the band are now? I think it's been pretty gradual but there's always moments. We did Saturday Night Live in '89 and that was a pivotal moment. For me, it made me realise we were changing. I'm very naive you know, and I just went along with it – 'oh yeah, we're selling records, we've got a record company, isn't that nice. But when we were on Saturday Night Live it just locked in brain: 'oh my God, we're on Saturday Night Live! I guess we're becoming a band!' And then the next day, after that show, we got our first tour bus, our first crew. The most recent big moment was leaving Geffen, starting up on our own and doing everything ourselves. It was a big relief, I felt freedom for the first time in a long while. Does it feel like coming home to be back on Latent Recordings? I don't know about coming home because when Latent was alive some years ago it was so small, it was a different entity. It was really just a way to get our records printed –basically we would sell them to record stores and just hope they'd give us some money for them. But now it's a business, a way of keeping ourselves afloat and allowing us to do our music. It's a lot of hard work actually, but it was almost a salvation. Prior to getting off Geffen we were just so... tired, that's the word. We were tired of the whole game, tired of fighting record companies... We certainly weren't tired of the music or tired of each other, our touring was great, we had a lot of fun. But when it came to dealing with the record company, all of us would just want to run away. So we did! It was a big step and it felt right and it still does, it feels good. The phrase 'slow, sad waltzes' in the title of your new 'rarities' compilation defines the quintessential Cowboy Junkies sound. Is this a style you always set out to capture or did you chance across it? Whites Off Earth Now, our first album, was very blues-oriented, very slow, very open. There were no strict rules like 'verse-chorus-verse', it just sort of flowed. I think from the beginning our goal was just to let the music happen. Who cares if it's proper or even if anyone likes it! The groove was always important to us – that was the main thing. We didn't even bother to write – the focus was all about the groove and if that sounded right we'd put any words to it. As we got better at that we started to write our own words. But after Whites we toured the States and discovered country music for the first time. It had a huge impact on us, huge. None of us had ever really been introduced to it as younger people and now we were all introduced to it at the same time in the same way. We were travelling round the States, listening to radio stations, having this discovery together. Obviously, it really impacted hard on our music and the live sound. Especially the singer! Doing those slow, sad waltzes in that sort of style suited my voice perfectly. I fell into it – I closed my eyes and I was there, there was no thinking, no nothing. I could do a slow, sad waltz all night long... one long one! The distinctiveness of your sound is all the more obvious when you hear your cover versions which take familiar songs and then flatten out the familiar melodies to emphasise mood and atmosphere. Marianne Faithfull and others have done Dreaming My Dreams, for example, as a singalong country-pop song but you seemed to fill it with melancholy on The Trinity Session. Again, that's where we were at then. We knew groove and mood was what we did best as opposed to trying to do a particular style. But basically it's because we weren't very good musicians! If someone had said, 'can you give that a more country flavour?' or 'give it a more blues flavour' we wouldn't know how. Nowadays I think we could because I think we're more accomplished. But in the early days Peter, our drummer, and I were totally new to music as far as performance goes. We'd just do whatever came naturally and not try to think about it too much. I think that's why people attach themselves to The Trinity Session so much – because that album is just about mood. There's nobody trying to put anything on because we didn't know how. These days, do you feel genre in music is something to rely on or is it something to subvert? In talking about this, I often feel 'I don't know what I'm talking about!' and I really don't. When we get together to write, it's still a mystery. Cowboy Junkies is definitely the four of us. If one of us left and we got another bass player or another drummer, I don't think we'd have the sound we do now. Although Michael definitely is the songwriter and definitely is head of the band with the musical foresight to guide us. But to do that he needs the four of us and whatever it is that happens when the four of us get together to make our music. I'm not sure what happens, or why. A lot of Michael's songs spring from very definite characters' viewpoints, often embodying quite different perspectives if you contrast the weary Bea's Song with the defiant Floorboard Blues, for example. Do you feel you have to be a bit of a blank canvas to interpret all the voices he dreams up or does he naturally write about women with whom you'll automatically feel a kinship? I think in the early days Mike wrote songs that I might be able to identify with in order to make it easier for me to sing. I didn't have the experience to go beyond my own feeling. Nowadays he just writes whatever and has done for quite some time. The greatest thing – and sometimes the most frustrating thing – about Michael and me as a team is that he never tells me what he's writing about. I'll often get a song and go 'I don't know what this means! I have no clue.' He won't tell me or even give me a direction. Sometimes it takes for ever for me to find an understanding of the song. As a singer that's a great thing because it allows me to have my own interpretation, even if it's totally wrong or different from his, he allows me my input. But, as I say, it's also frustrating because I don't know how to start. I wish he'd tell me what it's about – just give me a hint. But I think as a singer I'm a storyteller and that's the way I look at it nowadays. Whether I've had that experience, whether I've gotten into that car with that stranger or not, whether I can remember having my heart bleed, it doesn't really matter any more. I want to tell the story and I want you as the listener to believe it. I want you to believe I have gotten into that car, that I've sat by that river, that I am Bea. When I do a good job, people will think that I wrote the song. To Michael and me that's a complement – it shows we've done a good job. You probably have more storytelling songs in your repertoire than a lot of your contemporaries – is this a tradition in songwriting you feel is getting lost these days, a dying art you're remaining loyal to? Well, it's certainly getting lost as far as publicity and easy access to it. I don't think it's lost as far as artists out there performing it. I think that kind of songwriting has been around since the beginning of time, as soon as we began to spread news around. But we don't hear as much of it on the radio which is frustrating. But that's a whole huge other conversation – what's going on with record companies and radio stations, the smaller amount of different kinds of music that we're hearing today. But I think if people are really interested in music, or anything, they'll find what they like. They'll find Cowboy Junkies or they'll find Jimmie Dale Gilmour, Lucinda Williams, Gillian Welch... whoever is out there doing that kind of thing. There's a lot of them! They'll always be out there... they just won't be all that rich, will they?! Like most of the people we cover. So many talented songwriters are now resorting to releasing their records themselves. Maybe it's optimism but with record companies becoming more narrow-minded and just looking at one kind of music, where everything has to be a mega-super-hit or it's not worthwhile, what's happening now is that there are more artists out there who do make some money, who do bring it in. And they're now going to independent labels or starting up independent labels and because they do have some money, like Cowboy Junkies, and they have a following so they can sell some records, I'm hoping that these independents will now have access to some cash to build them up a little bit. Maybe you'll never be able to compete with the mega-companies, but who cares? As long as you can continue to put your music out and pay the gas bill, nobody really cares. I hope that's what will happen; the other way is that people like us will get too tired of fighting the fight and will just disappear! [laughs] But I don't see that happening. Musicians have always had some kind of fight on their hands – they've been poor, they've been rich, they've been ripped off – it's nothing new! I've always loved the intimacy of your records, the conversational feel where you put on one of the albums and it feels like you're in the room speaking directly to the listener. I think that's just an extension of our personalities. We just do what we do, we don't put on a big [live] show with lights and all that. You know, I chatter a lot, or I don't if I'm not in a chatty mood. There's no set rhythm or pattern. Maybe it's part of our Canadian personality – we've always been a little bit astonished that somebody's liked it and listened to it. Not because we've never thought it was good but because we've never been pushy people. So to be on stage is kind of an awkward place, I'd never have thought in a million years I'd be fronting a band! It's not my personality within my family, within my whole life experience – I never was the kid in the front of the photograph. So I think in order to strip away that weird feeling of being in showbiz, we've always tried to keep it natural, conversational... normal. After every show for years I've always invited people to stick around afterwards so I can talk to them and people have always asked me why. And I think again it's to break that barrier between being on stage and people in the audience, that 'Here I am!' thing embarrasses me. Going out and talking to people brings me down to being normal and makes me feel good and less showbiz. If our records come off that way, and I think our website comes off that way, we wanted to reflect our personalities to be more friendly, I guess. You've talked about how being Canadian has affected your career – do you feel part of any movement of Canadian music? There's a kind of desolateness, a melancholy in the best music from your homeland. We're not very much part of a Canadian scene – here in Canada we're almost totally ignored as a Canadian band. It's funny because a month ago we were watching the Junos, our equivalent of the Grammys, and a friend turned to me and said, ‘don't they ever ask you to give away an award?’ No, they never call! And I'm quite glad about it. So on that level we're not a part of anything, but I do feel when you look at Canadian bands like the Band, Leonard Cohen, Joni Mitchell... even Sarah McLachlan or Alanis Morissette, there's a common denominator amongst us all which makes us somewhat similar. I think it's our Canadian personality and I think it so strongly sticks out because once you get a name in North America, once the Americans give you a name they kind of claim you as their own. If you put a Canadian band up against an American band, there's a difference. The Canadian band is much more low-key. They don't sparkle as much, they don't stand out as much. When you start to look at us as a group, that's what happens. You're not as big a star – even if you're Alanis Morrisette. She's huge, you can't sell more records, but when you see her interviewed, she's just a little girl, a nice girl. I think most of our artists have that – if you want to be a star yet be able to walk down the street and not have anyone look at you, you have to be Canadian and live in Canada. It's nice – no one cares! Alanis could walk down Queen Street here in Toronto and no one would care but if she did in New York people would swarm her. Here there's a little bit of a not shy but... reticent attitude. How do you approach projects outside the band like those with Jules Shear and Bruce Cockburn? I love doing it and I wish I could do it more. When I was with the record company one of my biggest aggravations was whenever anybody would ask me to do something I had to ask their permission and they often would say no. They always had some stupid idea – often the person wasn't huge and they thought it wasn't going to further my career – like I care! Now that I no longer have to ask anyone for permission but myself I'm open to do it with anybody if I like the song. I did a lot of things with songwriters down in Austin, Texas – people who aren't well known but we were talking about that genre of telling stories in songs and that's definitely down there, they just write songs that I wanna be on! I'd love to be known as a back-up singer, somebody you would think of first if you wanted female vocals on an album, someone like Emmylou Harris. If you had a say in casting the biopic of the Cowboy Junkies, who should play whom? Can they be dead? There's nobody alive that I'd want! I'd like Ingrid Bergman to play me because I love her. Cary Grant for Pete, my drummer and my brother. Mike would have to be one of those quiet people like Clint Eastwood or James Coburn, rugged but mysterious. For Al – Richard Burton! Do cinema and photography influence the songs and sound of the band? Yes, I think so. Michael's a huge movie buff, he goes to movies all the time and worked at the Toronto Film Festival for years and years and got a Golden Pass so he could run around and see everything. Alan too is very much involved in that and has a lot of friends who are involved in film. Mike's done a lot of scores for young, independent filmmakers and loves doing it and would do more and more if he could. With Michael's writing, because he has such a sense of atmosphere and description, in his songs you know what time of year it is even if he doesn't mention it – you know if it's winter or spring! For me, the visual part of it comes from Michael – it's already a film. I can see Bea, I know what she looks like, I can place her by the river, I know what the river looks like. If I was going to put it into film, I can do it. I even know where the sun is. When we're writing, when we're talking about the song – and again, none of us are musically trained, so none of us talk in musician's talk – sometimes to get us all in the same groove or the same place I'll say 'the river's really rushing' or 'it's really slow'. I'll describe the feel of the song, to maybe get the drummer into my headspace if it feels like we're not connecting, I'll describe it visually rather than in musical language. I'll even describe the day, whether it's clouds or no clouds. or I'll say, 'remember that time we were skiing in Aspen and there was that breeze?' – something no one else would understand but all of a sudden Pete will start playing in exactly the right way. A lot of that has to do with us being family – words mean the exact same thing to one another. How do you approach recording now? The 'one-microphone' technique of your early albums was such a trademark at first but you've obviously been moving into more produced waters lately. Even so, is it still important to keep things simple, to play as a bond and just record what you play? Definitely the one we're working on now is like that, we record as a band and that's it. This one has very few overdubs and it's a response to our last one, Miles from our Home, which was the most produced record we ever did, which was intentional 'cause we had the budget. We got a big producer and went into a big studio and did it the more conventional way. Working with John Leckie was great - we learned so much. But our hearts are more in the place of just going in and playing and listening back to several takes - 'this was a good take, that was a bad take; that was perfect, don't do it again! ', you know. Even leaving in some of the mistakes for fear you might clip out something else. That's where we sound the best. Even though we're better musicians now, our sound is still based on groove and mood, and the way to get that is by playing together. So you're working on a new album right now? Yes, we're working on a studio album and we have been for some time. We're working on it really slowly rather than writing it and then going into the studio to record it. We've got this place called Chemical, a one-room studio, sort of a garage place down the road from us which we can rent very cheaply and go in and record and if we get something that's good and if we don't, who cares? We haven't wasted millions of dollars. I think I am optimistic in a way. I don't dream of having a big hit album where once I might have. I never really thought it would happen to us but it was certainly a possibility for a while - we were playing in the big league, so you never know! I don't really care one way or the other, as long as I can continue to travel on my bus because I like my bus, and have a good crew 'cause my crew are great and I don't ever want to not be able to pay them what I pay them now. Those things are important to me. I'm optimistic that the Junkies as a band are really strong, we still really want to play together, and we're all willing to work really hard. I've never worked as hard as I do now. We're getting ready to tour in June and tomorrow I have to look at merchandise to sell at the T-shirt stand - I've never had to do that before! But now it's a big part of what I do. So I'm optimistic that we can make it work because we really want it to work, and that we can make enough money to keep our lifestyles where they're at, and that's saying a lot in my business. But it's always a struggle and it makes me frustrated at times, that putting out music has to be so hard, to get on the radio or to get people to hear what you do. It seems it shouldn't be that hard but, it is.